The Parent’s Corner gives you access to everything that is happening behind the scenes as your child progresses through MITA. 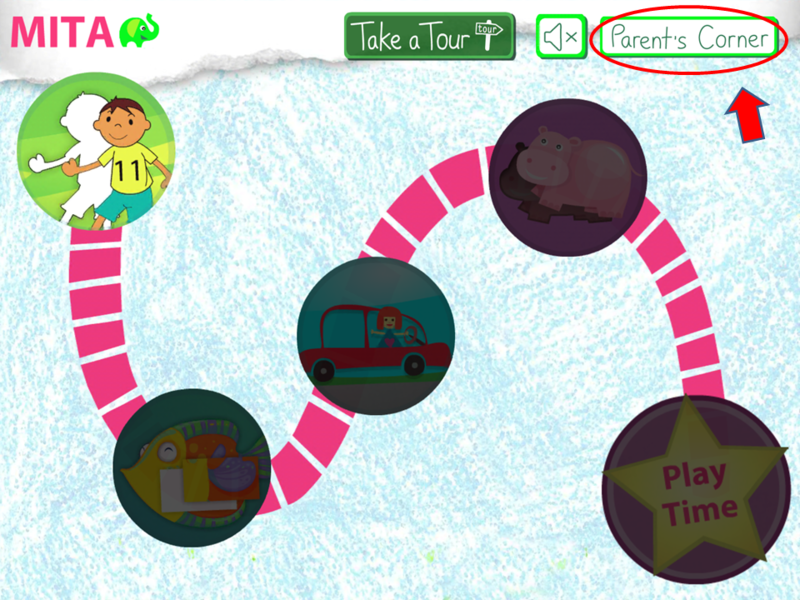 You can access the Parent’s Corner any time from the Main Screen. Let’s start by taking a look at the Progress tab. 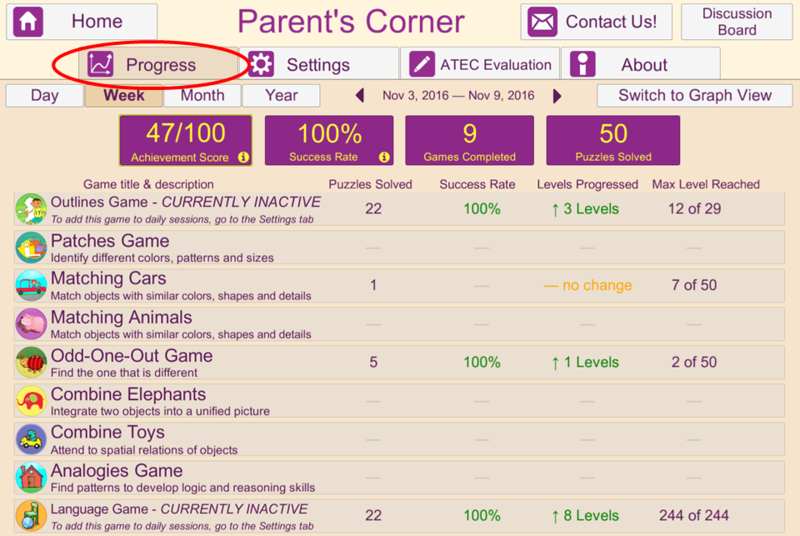 In this section, you will be able to monitor your child’s daily, weekly, monthly and yearly progress. 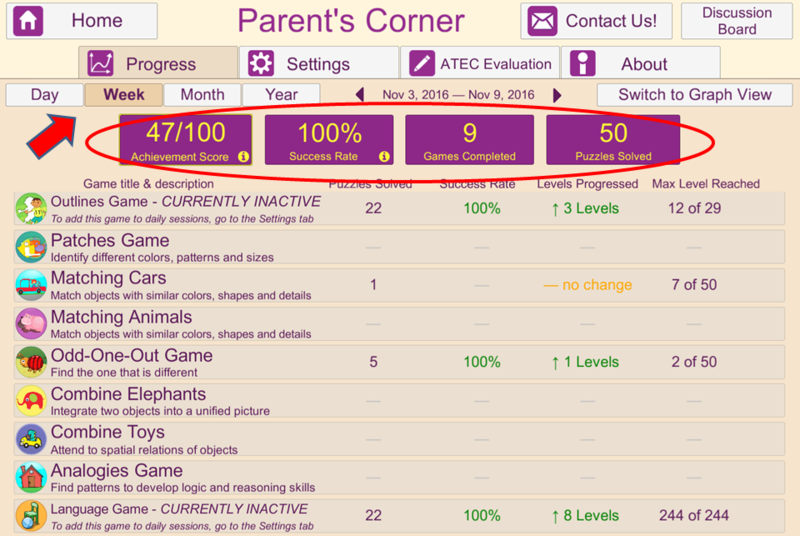 At the top of the screen, you will find your child’s Achievement Score, their Success Rate as well as the number of games completed and the number of puzzles solved in a given timeframe. The MITA Achievement Score measures your child’s cumulative progress with MITA. 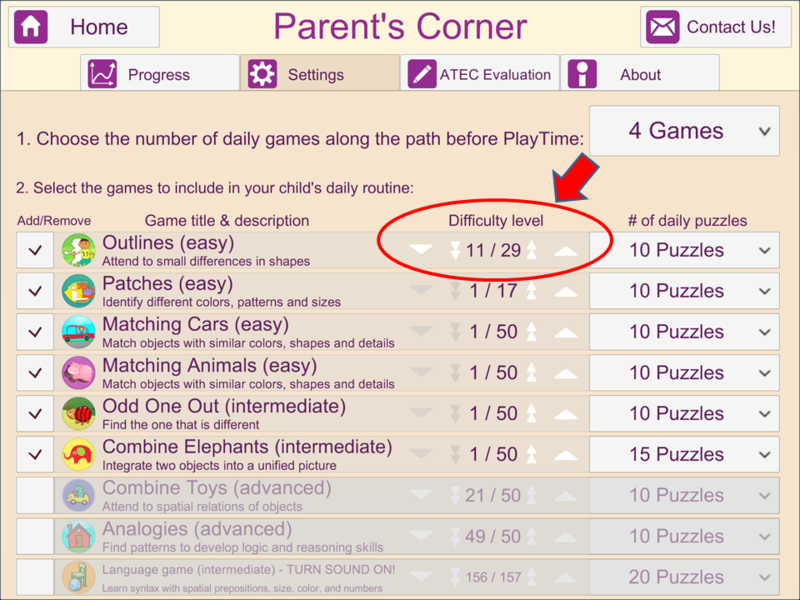 As your child progresses through various levels of difficulty in MITA games, the MITA Achievement Score will increase. Reaching the highest level of difficulty in all games will correspond to a MITA Achievement Score of 100. Your child’s Success Rate is the measure of the number of errors made when solving puzzles. It is measured from 1 to 100%. To progress to the next level in a game, a child must maintain a Success Rate of over 94% (no more than three errors in ten puzzles). The game difficulty level is automatically reduced when the Success Rate is below 76% (12 or more errors in ten puzzles). 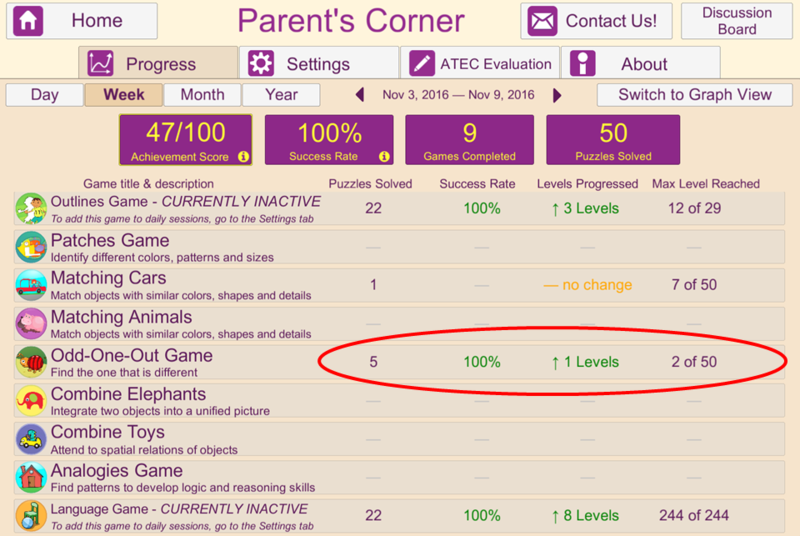 Below the MITA stats, you will find additional information on your child’s progress in each game: the number of puzzles solved, their success rate (how many mistakes they made) as well as the number of levels they have progressed and their current level within each game. 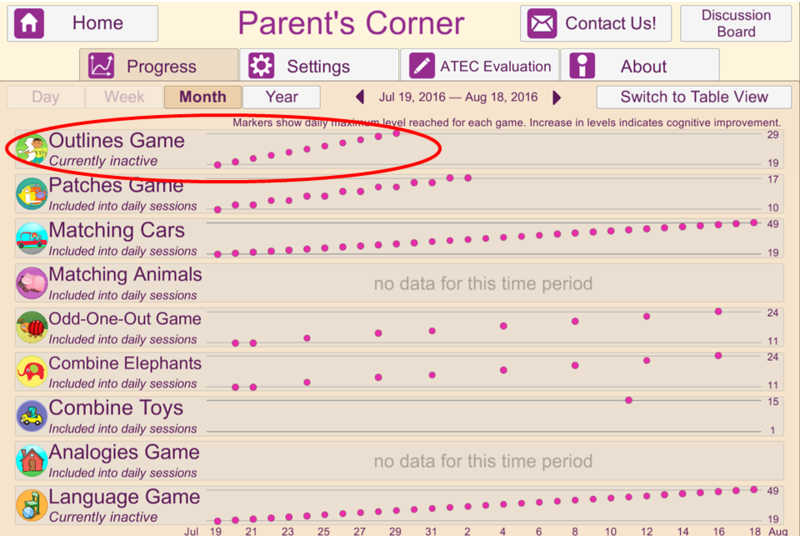 You can tap on the Graph View to see a visual representation of your child’s progress in each MITA game. A general increase in the graph curve indicates an overall cognitive improvement. MITA’s adaptive algorithms have been designed to provide just the right amount of challenge for your child. However, if you’re noticing that MITA is too easy or too difficult for your child, the Settings tab can help you customize your child’s MITA experience. Select the number of games in a daily session. 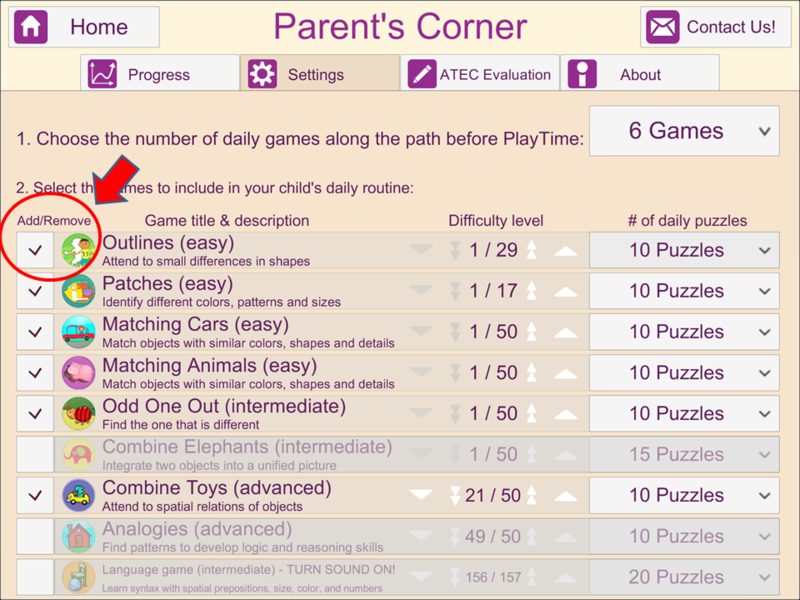 You can reduce this to as few as 1 game per session, if your child is struggling to reach playtime, or increase it to as many as 6 games per session, if your child is enjoying the challenge.Use the pull-down menu at the top of the Settings page and tap on the number of games you would like per session. 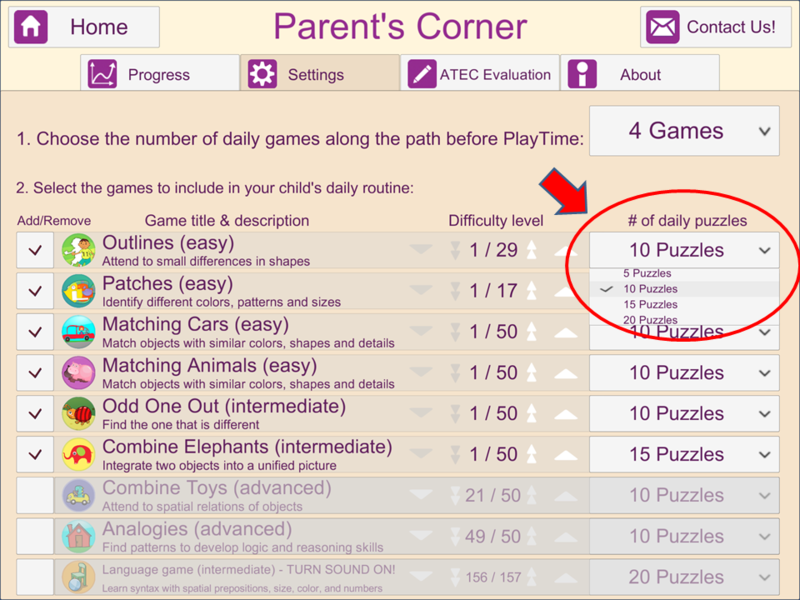 Select the number of puzzles that your child must complete within each game. You can reduce this to as little as 5 puzzles or increase to as many as 20 puzzles per game using the pull down menu. 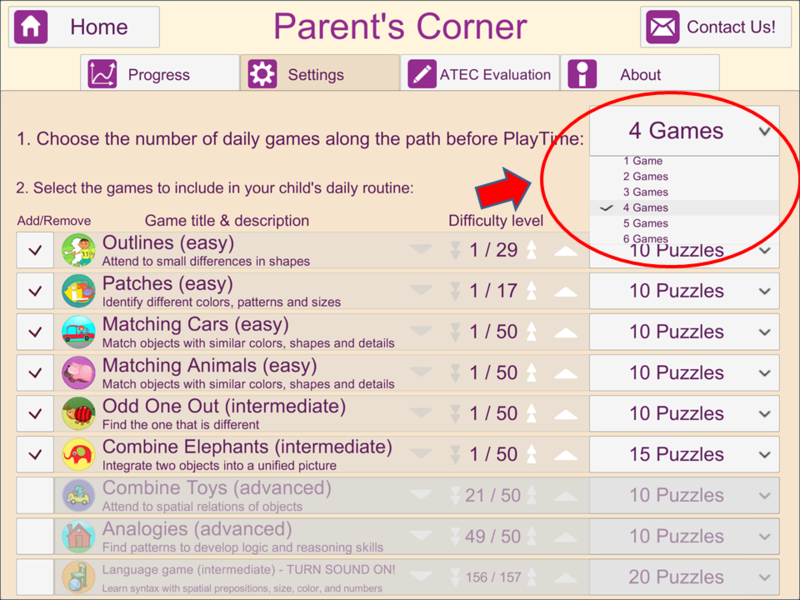 Choose exactly which games your child encounters via the checkbox to the left of each game title. We have arranged the games roughly in the order of difficulty, but please keep in mind that every child will have their own strengths and preferences. Please also note that MITA is adaptive and will automatically add the more difficult games when it concludes that the child is ready. Adjust the difficulty level for each game (though please note that we discourage you from doing this as each game will adapt automatically to the optimal difficulty level). 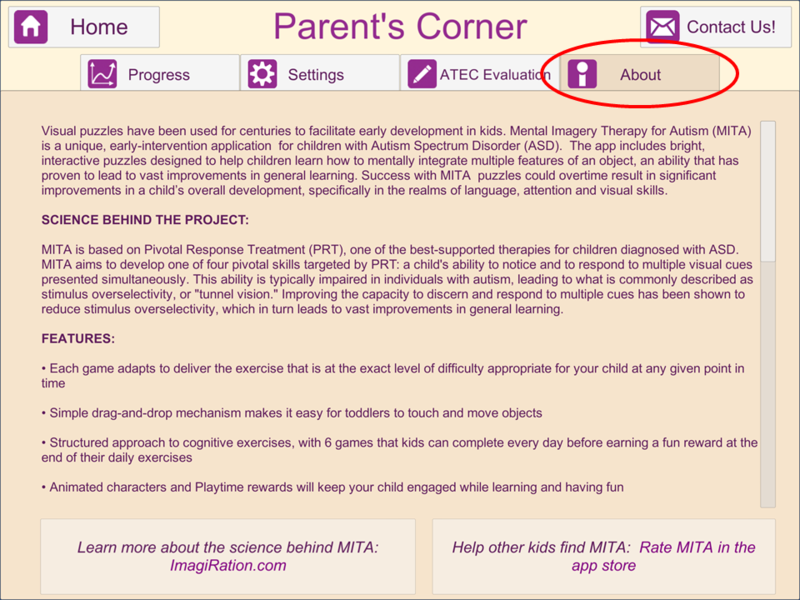 As you can see, Settings allow you to be in complete control of the MITA application in order to fit your child’s needs. 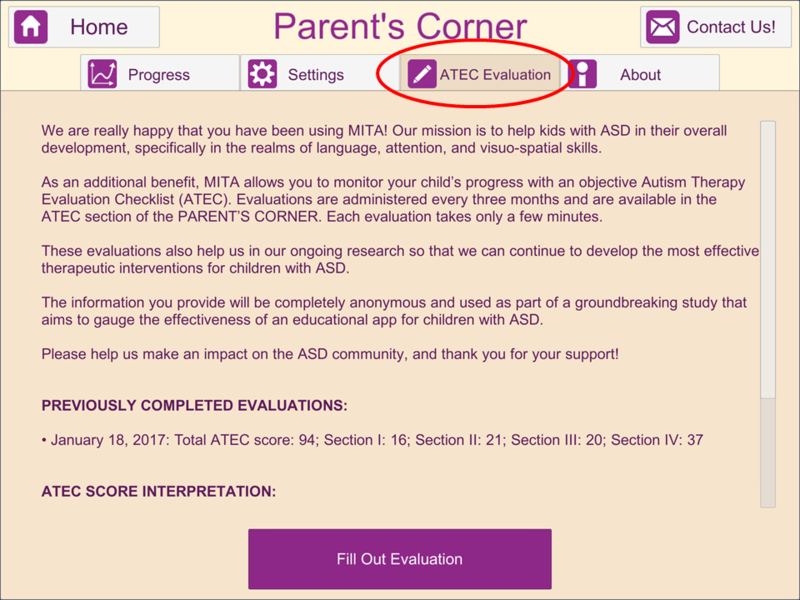 The Autism Therapy Evaluation Checklist, or ATEC, is also located in the Parent’s Corner. This evaluation allows you to document your child’s symptoms and provide us with completely anonymous and invaluable data on the effects of the MITA app. This information helps us in our ongoing research into the most effective therapeutic interventions for your child and other children with ASD. These evaluations also allow you to monitor your child’s symptoms over time using an objective assessment. Finally, the About tab provides you with additional information about the science behind the MITA project, the features of the app, as well as some tips for optimal usage.